Greendale is located 90 kilometres east of Vancouver and is part of the city of Chilliwack, British Columbia, centered about 7 km to the east. The northern boundary of Greendale is formed by the TransCanada Highway while the southern boundary is the Vedder River beyond which is the community of Yarrow. On the west the boundary is the Vedder Canal which also forms the eastern boundary of Abbotsford. Hopedale Road is roughly the eastern boundary of Greendale. During the latter part of the 1800s settlers with names such as Chadsey, Hall, MacGillivray, Toop, Zink and others moved into this area to begin farming. Originally the small settlement that developed was known as Sumas (to avoid confusion with a nearby town in Washington State the name was changed to Greendale around 1950). Before 1875, the Chilliwack River flowed north from the Vedder Crossing through Sardis towards Chilliwack. On 22 November 1875, a heavy rainstorm created a logjam and diverted the flow of the river into Vedder Creek and Luckakuk Creek. In 1882 a log jam was created by Sardis farmers to further inhibit the flow of water north into the Chilliwack River as well as Luckakuck and Atchelitz creeks. A flood in 1894 ensured that the blockage became permanent, creating stability for Sardis farmers, but problems for farmers in the Sumas Flats, where Greendale is now located. Some of the area that is now Greendale was part of Sumas Lake into which the Chilliwack and Vedder rivers flowed at an increasing rate after 1894. This 4,046 hec. (10,000 acre) lake swelled to 13,355 hec. (33,000 acres) during spring flood periods, fed by not only the Chilliwack/Vedder River system but also by other rivers flowing in from Washington State. In the early 1920s engineer Fred Sinclair developed a plan to drain the lake. By 1924, the Vedder River was diverted into the Vedder Canal, and water from the lake drained into the Sumas River and Sumas Drainage Canal, and was pumped over the dykes into the Fraser River. As a result, hundreds of acres of additional farmland was created. The land is generally flat and is excellent for dairy and fruit farming of various kinds. Mennonites first settled this area in April 1930. The Northern Construction Company was given the right to sell 274 hectares (686 acres), divided into 28 lots of 18 to 25 acres, at $42.00 per acre. The area was bounded by Adams Road, Hopedale Road, South Sumas Road, and Sumas Prairie Road. Apparently this land was open to Mennonites only. Once this area was taken other nearby land could also be settled. Source: Chilliwack Museum and Archives, P4512. As the population of the area increased, small businesses, mostly owned by Mennonites, were established mainly along Sumas Prairie Road. Concern about recreational opportunities for the youth led the Mennonite community to build a roller rink in 1947 which operated until 1953. 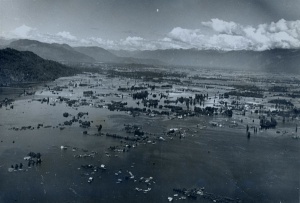 In the spring of 1948 most of Greendale was flooded after a dyke on the Fraser River broke and water covered a large part of the Greendale area. 400 to 500 people were affected by the flooding, with many losing everything they owned. It took some time for the people to recover from this economic setback but Greendale continues to thrive in its beautiful rural setting. The first school was opened in 1872 and it operated until 1927. In that year Sumas Elementary School, later known as Greendale Elementary School, was opened on Sumas Prairie Road. Another school, Chadsey Elementary, was built on Chadsey Road. It opened in 1966 and operated as part of the Chilliwack School District until 2002. This school was sold to Chilliwack Christian Fellowship (later Keystone Ministries) which has operated it until the present as Keystone Academy. The first church service was held in the home of a Methodist minister in 1865 and the Atchelitz Methodist Church was built along the Atchelitz Creek in 1869. Gradually the population increased and in 1885 the Sumas Methodist Church was built along Yale Road. Later this church became the Sumas United Church which functioned until 1971 when it disbanded. The Sardis Mennonite Brethren (MB) Church was organized at the beginning of 1931 with 24 members. Henry G. Dueck was chosen as leader with Jacob B. Harder as assistant leader. Later in the same year a church was constructed on property donated by the Duecks at the corner of Sumas Prairie and South Sumas Roads. The name of the church was changed to Greendale MB Church in 1952. Their largest membership stood at 360 persons in 1951 but had decreased to 257 in 2011. The Greendale Bible School was operated by this church from 1938 to 1946. The First Mennonite Church Sardis was also organized in 1931 with 80 members. A church was built along South Sumas Road in the same year. Nicolai Bahnmann, their first leader, was assisted by Bernhard Friesen, David Hausknecht and others. The name of this congregation was changed to First Mennonite Church, Greendale in 1948 and to River of Life Church in 2012 (the congregation had left Mennonite Church BC in 2007). Membership reached its highest point in 1959 at 294 and in 2012 it stood at 127. This congregation also operated the Menno High School from June 1946 until June 1948. Denman, Ronald W. R. and Shannon Anderson, eds. The Chilliwack Story. Chilliwack, BC: Chilliwack Museum and Archives, 2007. Enns, Ernie. Sumas, Greendale Businesses, 1930-1990. Abbotsford, BC: Ernie Enns, 2002. Harder, Katherine, ed. The Greendale Mennonite Brethren Church 1931-1981. Chilliwack, BC: Greendale Mennonite Brethren Church, 1980. Peters, Gerhard Isaac. 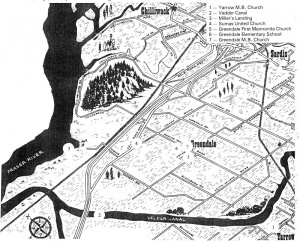 A History of the First Mennonite Church, Greendale, B.C. Chilliwack, BC: First Mennonite Church, 1976. Friesen, Hugo. "Greendale (Chilliwack, British Columbia, Canada)." Global Anabaptist Mennonite Encyclopedia Online. September 2012. Web. 23 Apr 2019. http://gameo.org/index.php?title=Greendale_(Chilliwack,_British_Columbia,_Canada)&oldid=128419. Friesen, Hugo. (September 2012). Greendale (Chilliwack, British Columbia, Canada). Global Anabaptist Mennonite Encyclopedia Online. Retrieved 23 April 2019, from http://gameo.org/index.php?title=Greendale_(Chilliwack,_British_Columbia,_Canada)&oldid=128419. This page was last modified on 9 December 2014, at 16:34.